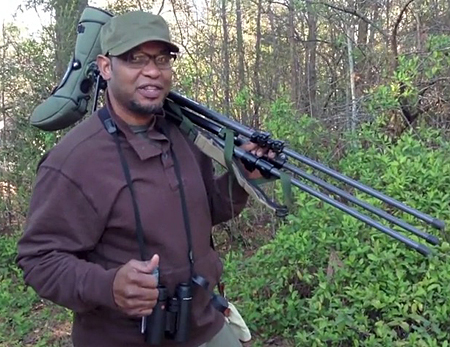 Blog » Drew Lanham Talks About "Rules for the Black Birdwatcher"
When Clemson professor and wildlife biologist, Dr. J. Drew Lanham, agreed to do a video for BirdNote, we had no idea of the reach the story would have. Based on a column that originally appeared in Orion Magazine, “Rules for the Black Birdwatcher” sparked a conversation that continues a year and a half later. When the video first appeared on BirdNote's Facebook page in February 2015, the response was amazing – the single-most liked and shared of any BirdNote post ever. It prompted comments such as this one from EveG: This video is important. It raises an important issue with a touch of humor. As a woman, I have to be careful about birding alone so I understand how he is vulnerable. So important to bring young people into nature. The future of the earth depends upon them. Thank you for making this video and raising awareness. And this one: Very interesting. Well presented, and sadly, I believe it is absolutely true. And this: As a white woman married to a black man and both of us being birders, I can attest to this being funny, shameful and true! There's a lot more to the story! KPLU’s Bellamy Pailthorp interviewed Drew Lanham about his journey from a childhood in nature to his adult occupation – and preoccupation – with birds and birding. Listen to the interview. Read the original “9 Rules for the Black Birdwatcher,” from Orion Magazine. Drew spoke with Audubon Magazine about why he became a birder. Read the article. A video about Drew as a naturalist, including several students who have been inspired by him, from Clemson Urban Ministries. Watch the video. Help BirdNote tell more stories like this: Donate to BirdNote today! Thank you. Funding for this video comes from the Chris Peterson Fund for Creative Storytelling.